The Boy’s Store has some awesome Halloween themed items available this month. Your boys can share their love of dressing up, spooking friends, and just enjoy the holiday all month long. Be sure to check them out of you have a Halloween fan at home! Boys Haunted Raglan Shirt by Wes and Willy: This fun and spooky orange and black raglan tee features a screen print with a skeleton and haunted house reading, “Come one come all to the scariest haunted house of them all!” Boys’ Flying Bats Twofer by City Threads: even our littlest Halloween fan can get in on the batty fun with this bat and spooky Halloween tree screen print. Boys’ Creepy Crawly Socks by Country Kids): Socks are becoming the biggest fashion statement of all. These are the perfect addition to any sock lovers repertoire. These creepy crawly socks come in gray and white. Boys’ Boo! Legwarmers by Huggalugs: Your little crawler and early walker will blow the fashion critics away in these Huggalugs. The legwarmers feature adorable Halloween costumes from the little witch to the perfect pirate. Did you know that The Boy’s Store stocks outfits for babies and toddlers too? We want ALL boys to be able to find super stylish and fun clothes to wear. SO we offer items that range from newborn to size 18. We do not want to let any boy go without unique and fun styles. We feel babies’ need style too. We carry a variety of clothes for babies and toddlers. We offer clothes that are fun, whimsical, brightly colored, and boldly patterned. Not only do these styles excite and entertain baby they can also aid in baby’s development. Did you know that until 6 months of age babies see the world in mostly black and white bold patterns? Their sense of color and smaller patterns develops later. So many styles can aid in helping your child to see and understand their world. le top Boys’ Vroom! 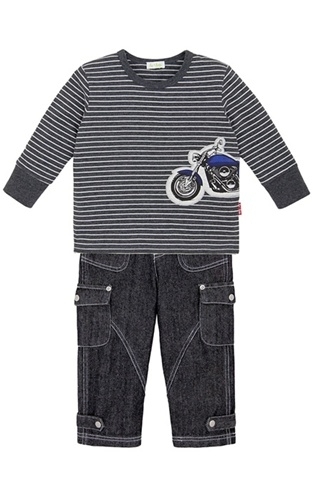 Motorcycle Shirt and Jeans Set: This bold striped black and white patterned shirt is perfect for young babies. It is fun, whimsical, and exciting for parents, and it will be seen and understood by a baby. 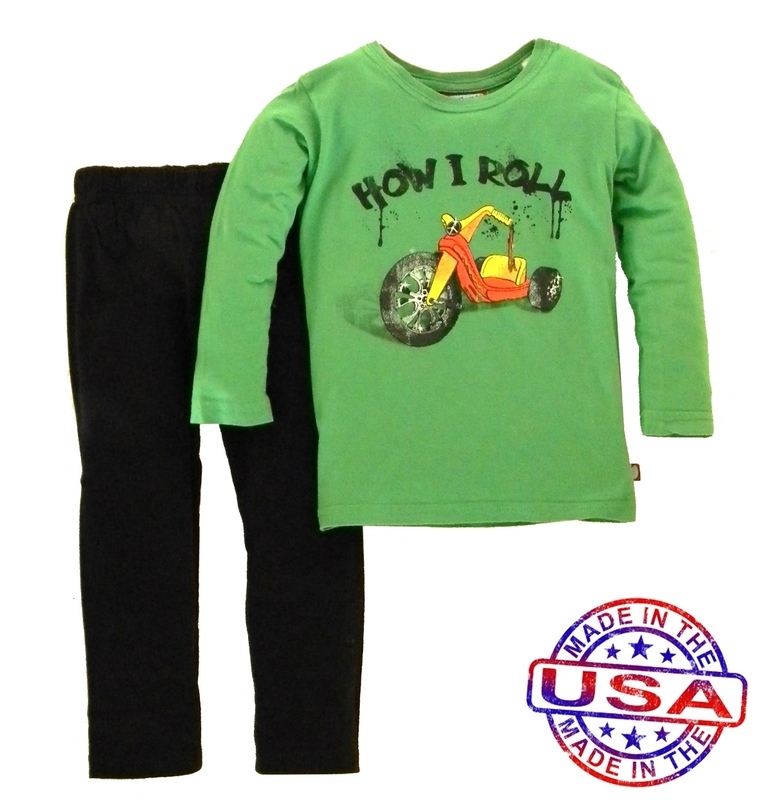 Boys’ How I Roll Pant and Shirt Set by City Threads: This more brightly colored shirt is perfect for older babies that can see and interact more with the world around them. This set is also made in the USA, which means it is eco-friendly and brings more profits and jobs to the USA. Here at The Boy’s Store, we strive to bring you and your families items that will be stylish, educational, and aid in the development of your children’s style and the world. This entry was posted in boys clothing and tagged baby boys clothes, baby boys style, baby clothes, baby items, boys, boys clothing, boys clothing store, boys outfits, boys styles, City Threads, le top, online boys clothing, the boys store on September 7, 2017 by Lacy.